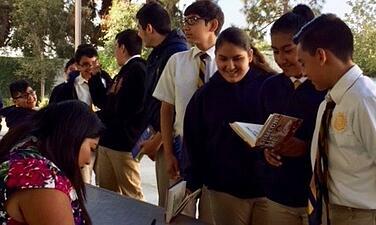 As part of the program “Authors to KIPP LA” (A to KLA), national best-selling author, political commentator, and social justice advocate Julissa Arce joined the eighth-grade students of KIPP Sol Academy in East Los Angeles for a presentation, Q&A, and book signing of her new YA memoir Someone Like Me: How One Undocumented Girl Fought for Her American Dream. In the book, Julissa shares her secret life as an undocumented Mexican immigrant in Texas, and her ability to overcome challenges associated with her status to eventually become a successful vice president at Goldman Sachs. Read on for more details. 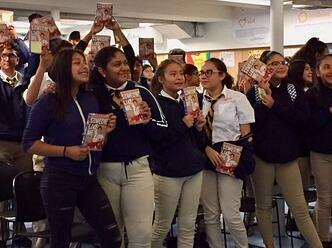 During Julissa’s presentation to the KIPP Sol middle school students, she explained the meaning behind the title of the book. “When I started thinking about the title, I realized I use this phrase a lot: Someone like me can become a doctor. Someone like me can own my own business. Someone like me can become a Supreme Court justice. Someone like me can become a vice president at Goldman Sachs,” she said. 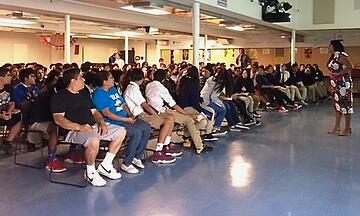 She then asked the students to share their own “someone like me” phrases. One student said “someone like me can become a lawyer,” and another expressed that “someone like me can become president,” which garnered vocal support from his fellow peers and teachers. Thanks to the generosity of the Terry Gilman, founder of the A to KLA program and owner of Creating Conversations, each eighth-grade student will have the opportunity to read Julissa’s story as they have all received a free, signed copy of Someone Like Me. For more information about the A to KLA program, click here. To support programs like A to KLA visit kippla.org/give.